Over the years, many would-be programmers have tinkered with the Genesis in a myriad of ways. Game hacks are common, and today’s scene even has completely new games on the horizon. Along with the common stuff, there are some efforts that deserve closer examination, including some unofficial ports of several games from the SNES (and even one from the Playstation!). Sega-1 6 contributor Sebastian Sponsel takes a closer look at these in the latest installment of Hacks & Homebrews. Read the full article for more information. It’s been exactly twenty years since the Genesis was officially discontinued, but its rabid fanbase refuses to give up the ghost! In addition to games still being released, fans in Europe have organized a yearly tournament that now includes almost two dozen titles. 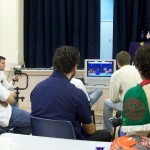 The Mega Drive Championships are where gamers play for keeps, and this year’s European tournament featured competitors from three different countries. Sega-16 contributor Sebastian Sponsel was there, and he’s shared his experiences with us in great detail. It looks like a good time was had by all, so be sure to read the full article and enjoy your turkey! Rocking and racing are two things that seem to go together well. Think about it: rock music blended with fast paced racing action; how could it go wrong? Well, what if the hardware wasn’t really able to produce the rocking part as it should? Is the solid gameplay of a faithful port enough to make up for it? When traveling abroad, it’s always fun to search for treasure of the 16-bit kind… that special game that you would never find in your local area, something exotic and wonderfully foreign – the kind of thing that makes game hunting worth all the effort. 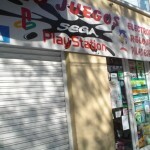 Sega-16 is dedicated to showing its readers the best places worldwide for buying Genesis goodies, and while it might not require a whip and Fedora, the hunt can be just as much an adventure. The latest installment of Genesis Around the World features one of our readers exploring the hack and pirate coves of Córdoba, Argentina, and he’s got all the details on what you’ll find. Like ball games? Violence? How about if we combine the two? The Bitmap Bros. did just that with its Speedball series, and Genesis gamers received the second game via Arena. Simple in presentation and gameplay but big on challenge, Brutal Deluxe strove to live up to its namesake despite changes made during the porting process.